The former center of Nasrid Spain is a mix of Moorish, Spanish, and Gypsy influence. Winding, cobblestone streets can be tough on the ankles but are begging to be wandered on foot. While the city is compact, it's full of some highly-touristed areas like the Alhambra that need a little advance planning. Read on for my overview of things to do in Granada, Spain. • WANDER AMONGST HISTORY: The massive former fortress of the Alhambra looms over Granada, inviting you to explore its many wonders. The site is available all day and into the evening. Around the central area, check out the absolutely massive Catedral de Granada for beautiful sculptures and murals with a free audio tour. Take a walk up to Sacromonte to visit the peaceful and lovely abbey. • ENJOY THE CULTURE: Wander the beautiful cobblestone streets in this compact, picturesque city with a camera and no set itinerary. Hit up a flamenco show or try taking a class yourself! • EAT: Iberico ham. Spanish omelet. Calamari. Tapas culture is strong in Granada. As is the meat-and-cheese loving. Vegans may find it a bit of a challenge, but meat and/or dairy eaters will find it easy to keep their stomachs full. The good news? Tapas are free with the (very low) price of a drink in cafes and taverns around town. 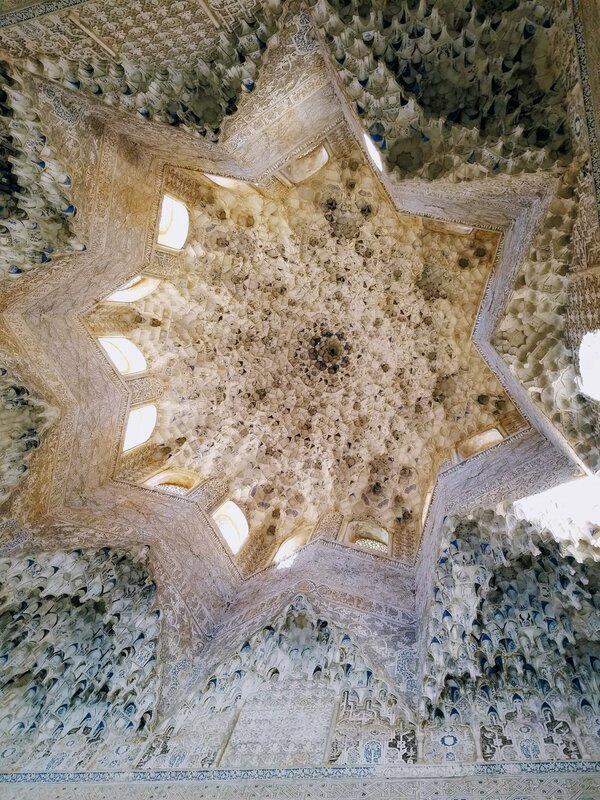 • RELAX: Given its Moorish past, Granada has embraced the bath house, also known as hammam, tradition. There are several relaxing places in town where you can soak your sore muscles or get them massaged. Prices and experiences vary from one area of town to another. You’ll need a bathing suit to enter, as the hammams are mostly coed. -Book a guided tour - there are a great many on offer. It will cost a bit more, but will provide some of the information and back story that is missing onsite. -If you’re staying at a hotel, check with them if they have tickets they can sell you. -A limited number of tickets are available the day of if you’re game for getting there early to wait at the ticket office. -Get a Granada Card. This is the option I went with. You select a date and time for the Alhambra, but the 40 Euros also covers most of the other museums and cathedrals in town for one week from that date, as well as one ride on the hop-on hop-off trolley, and several bus tickets. The old, quaint, compact city center is paved in cobblestones. Beautiful for photos, not good for rolling luggage or flip flops. Make sure to bring comfortable, sturdy shoes and try to pack light. The city is compact enough that it’s a fairly easy walk, cab, or bus ride to get to the sites. However, if you’re traveling alone, I would recommend staying closer to the city center. That way you can save on cab fares in case you’re going home late at night, and it’s easier to pop over to bars/restaurants/cafes without having to worry about how to get there and back again. Look for places in El Centro, Albaicin, or El Realejo. In El Centro, I can recommend Palacio de Santa Ines or Anacapri as good deals at boutique hotels (though for the Palacio check in advance if your room has a window!). If you’re driving into town, check with your hotel or airbnb as to where you can park. Parking is difficult, extremely limited, and often expensive. Furthermore, cars are not allowed in the crowded central streets without a permit - it’s why you’ll see almost only cabs on some of the one-way cobblestone streets. Presumably this is to avoid seeing tourists with their cars stuck in alleyways that are too narrow to fit them. Given the size of the area, either don’t bring a car or park somewhere further out and just bus/cab it around Granada. As I mentioned above - free tapas. I feel this needs to be repeated a few times. If you’re at a bar drinking a very affordable beer (known as a caña) or glass of wine, you will get a small plate of something to munch on - olives, a small slice of an omelette, some bread and ham, etc. The easiest way to save money in Granada is to conduct your own bar crawl and taste the tapas along the way. Check what holidays are happening - Much of the city shuts down during the Easter week celebrations. Know what to expect arriving into town by checking out my short guide. The Spanish I met were generally open and happy to chat. If you’re looking for other backpackers, check out the British and Irish pubs in the central area. Keep in mind they're going to be extra loud and crowded during soccer and rugby games. I spent a good hour at Hannigan & Sons trading destination recommendations with a variety of Europeans, Aussies, and Americans. EATING AND DRINKING - SOLO OR IN A CROWD? As in much of Spain, Granada's restaurants and bars don't start to fill up until at least 8pm, often much later. Going on the early side could be helpful if you're looking to avoid a wait at a trendy place, or if you just want to sit and read and have a quiet meal. Waiters will neither disturb you nor find it odd that you're there alone. However, if you're looking to meet or observe others, plan on starting your night later. I never felt unsafe in the time I was there, and that included two nights staying out late as well as hanging out at bars drinking wine and beer in order to get tapas. The late night Spanish social culture is very much alive in Granada, and as I was staying in the city center, my walk from restaurants was generally only 10-15 minutes, and the streets were filled with diners and fellow travelers. If you're returning from Sacromonte or have a long walk through a residential, less populated area, I would consider taking a taxi just to be safe. Find this guide helpful? Pin for later!